This week’s ADALife Bloggers tell us about their weekend travels over their four day weekend! As I write this, I am sitting in the Florence airport anxiously waiting to board my flight to Copenhagen and my first flight alone. As I see the nervous, tired, excited travelers around me I wonder where they are going. Home? To work? To see family? Friends? Just traveling? The possibilities are endless. As I consider that I am about to embark on a journey with strangers I will never know, I wonder how I am doing this so easily. Almost 4 weeks ago, I arrived in this very airport completely unsure of what I was about to experience. In life, my biggest fears lie in not knowing what’s next or what lies ahead. Yet, living in Italy and especially at the Accademia for the past month has been the most comfortable, authentic experience I could have ever hoped for. In the same spirit of this feeling I am learning, but not just about art- about life. 1. The world isn’t just big, it’s huge. There is so much I haven’t seen. And there is so much I want to see, but even after 3 months I won’t have seen even close to half of what I want to. There are too many beautiful places in this world that I have taken for granted. 2. This place is magical. It is a safe space that fuels my creativity. I can feel myself slowly letting go of insecurities, doubts, and fears. Instead I am learning to embrace the artist that I am and the art I want to create. 3. I am realizing how much I care for the people I am not able to see. Being away from home isn’t easy, and as much as I love living here, missing people reminds me how much I love and appreciate the people I have in my life at home. I spent the past weekend traveling south (Naples, Salerno, Capri, and Pompei) with 4 other theater students (pictured below) and to be bold… I think Capri might be my favorite place in Italy so far. 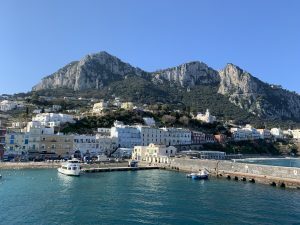 The pizza in Naples on Friday was great, the historical maze of Pompeii was fulfilling, but hiking in prime citrus season in Capri/Anacapri takes the weekend for me. We brought oranges to the peak of Monte Solaro, almost got attacked my mountain goats on the way, and still made it back to the ferry home in time. A beautiful place is optimal, but a good group to experience it with and split a bottle of wine (or many chocolate candies) with afterwards is even better. Try the local food. And by local, I mean restaurants that don’t have a menu in English. Stop someone in the street and ask where they like to eat. Or go to a touristy area and then wander a few blocks away. It’s worth it. It’s worth spending money on seeing local theater (especially if you can find cheap seats!). I went to see Blood Wedding by Lorca on my own at the Estates Theater (where Mozart got a 13min standing ovation) and it was an incredible experience. The Czech style of theater was completely different from what I am used to and was definitely worth seeing. Learn basic phrases. The first thing we did when we landed in Prague was learn how to say “please” and “thank you” and it most certainly makes a difference when talking with the locals. Try new things. This goes for everything–food included. Order something you don’t recognize on the menu. Learn about something you know nothing about. Wander. Hello ADA blog frequenters! These past few days was a long free weekend for those of us at the Accademia and some friends and I spent the past 3 days in Prague. It was probably one of the most beautiful cities I have ever seen and one of my favorite experiences. So in honor of Prague, here are 7 things to know about Prague that I learned in my time there! 2. Czech is a hard language and the Czech people KNOW it. 6. Go on a free walking tour, the tour guides are usually longtime residents of the city and are so knowledgeable and absolutely love Prague! In the end, if you have the chance GO TO PRAGUE! You won’t regret it!